There’s a lot to catch up on in this edition of Shine! 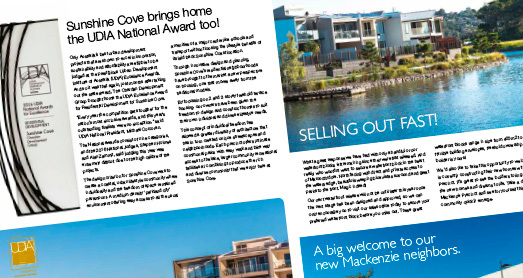 Just months after taking out the state award, The Chardan Development Group brought home the national, UDIA Excellence Award for Residential Development for Sunshine Cove. Mackenzie Precinct becomes a hive of activity as builders begin building new homes. Some of the waterfront homes have to be seen to be believe as they take great advantage of the direct waterfront views. There’s also an update on all the excitement of the plans for SunCentral, Maroochydore’s new and vibrant new city heart. Plus in this issue: Community Development Update, House & Land for Sale Feature and more!